How many places in Orange County can boast being more than 100 years old? How about 108 years old? The iconic Stag Bar in Newport Beach can hold that tune and with its reopening at the end of 2015, it is continuing to barrel through the years and serve up the community with enthusiasm. Opened in 1908 on Balboa peninsula, the Stag Bar has hosted countless numbers of tourists and locals, constantly evolving with the times and remaining relevant. From being a gambling hotspot and bar to a martini bar to a cafe to a saloon type and so on, the establishment has gone through many changes but stayed true to being a place for people to gather, have a good drink, and enjoy some great times. In all this time, Stag has remained in the same family's ownership and has now been re-envisioned as Stag Bar + Kitchen with luxury suites above for those looking for boarding. We were invited to check out the latter part of their new name and spent some time enjoying the menu that Chef Jeffrey Moore had in stock. One of the outstanding and recognizable traits of Stag Bar has been their dark mahogany bar extending nearly 100 feet long, and even with the refurbishment of the establishment, the bar has remained. 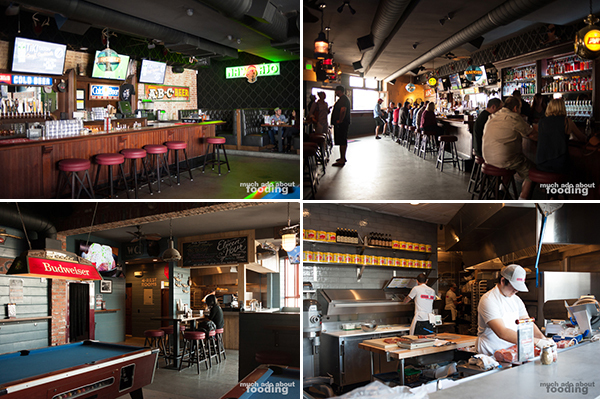 We found that it gave the bar a nostalgic vibe and also allows plenty of customers seats down the spanning room. Other retained elements of the first Stag included the metal signage on the walls (beer and wine signs) which were part of the original decor back in 1908 - these were recovered from between the building's walls during renovations. The kitchen was built out for the transformation to Stag Bar + Kitchen and took over a space where a liquor store used to stand for several years. With the addition of a food focus came the hiring of Chef Moore who was previously at Nieuport 17, Hopscotch, and Chapter One: the modern local among other restaurants in Orange County. 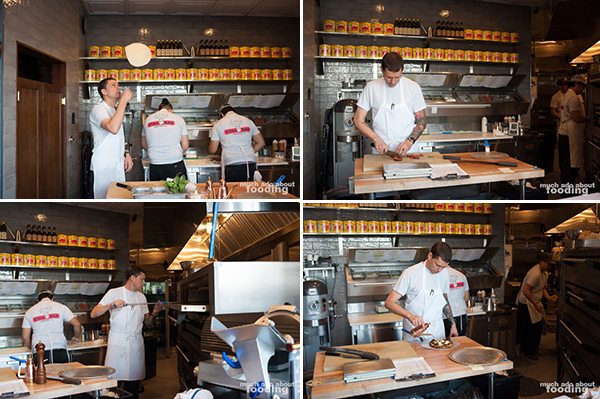 His menu was why we were there - dough and dedication to crafting solid pizzas. 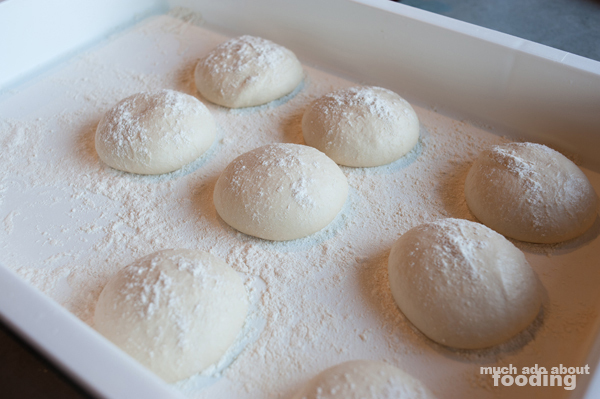 As he shared some secret ingredients with us that have made their way into his pizzas and sauces, Jeff spun out some dough made with Neapolitan flour, semolina flour, sugar, salt, fresh yeast, and arbequina olive oil. He talked hydration and technique on what made his crust so craveable. 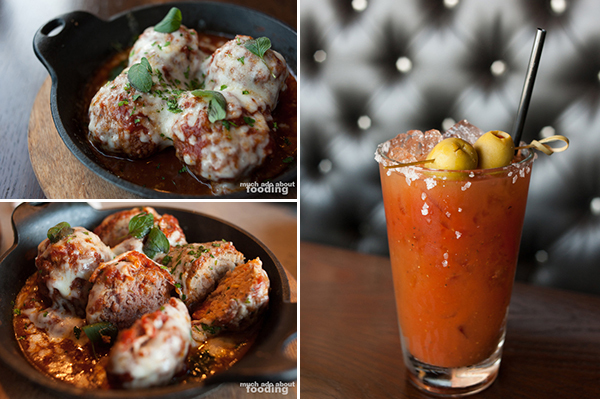 In addition to pizzas, Stag Bar + Kitchen also features Meatballs in a variety of options whether as $3 sliders, in a $9 sub sandwich, or hot in an $8 skillet of four meatballs. Diners get to choose the type - house grind, chicken balls, or stag balls (venison). 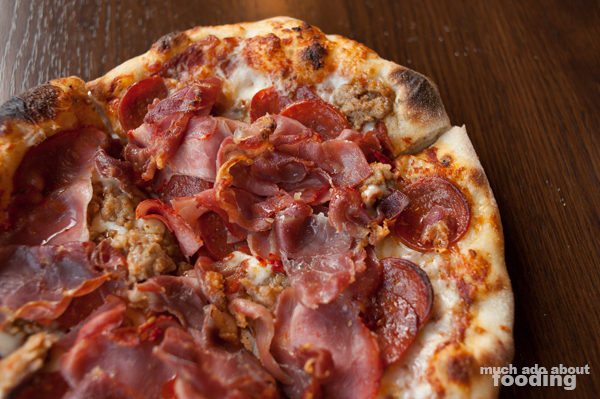 We thought that the house grind was quite unique as it is made up of several different meats, blending into a very flavorful round consisting of pancetta, mortadella, proscuitto, chuck, brisket, short rib, fat back, and pepperoni scraps. Chef's pick is the chicken meatballs so we had to try both. Our choice was their Grandma's marinara but you can also do an herb cream sauce over your selection; to top it all off was the choice from Mozzarella, Ricotta, or Provolone. Savory and rich, these meatballs mean business so if you're going to get yourself some, perhaps sharing can keep you from getting too full before the pizzas! 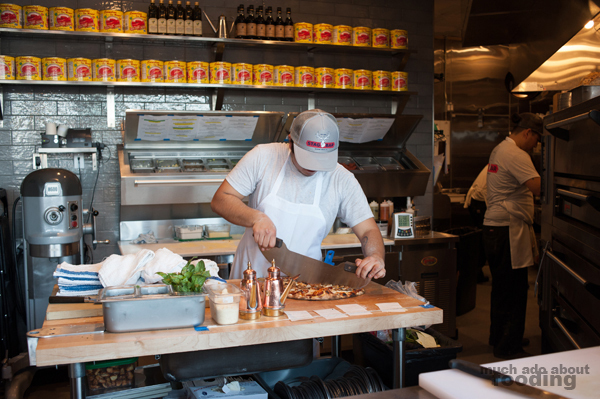 Overall, the menu was nearly overwhelming with great sounding toppings and styles that we knew we'd enjoy. These pies come in two sizes - 8" and 16" - which gives you the option between a personal pizza or one to share with a group. We started off with the most unique sounding one - the Genovese ($8/$16 - pistachio pesto, ricotta, brussels sprout, basil, and pistachio oil). In particular, this one was most intriguing for the use of pistachio in the pesto and the drizzling of pistachio oil to finish. 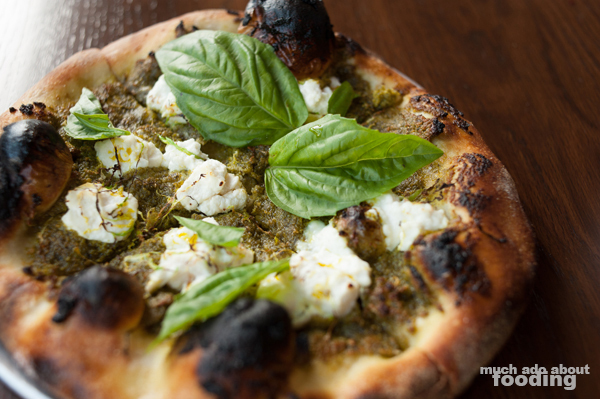 What came out was a great pizza that had the distinct nuttiness of pistachio alongside the thick savoriness of pesto, cut by the lightweight ricotta and fresh basil. 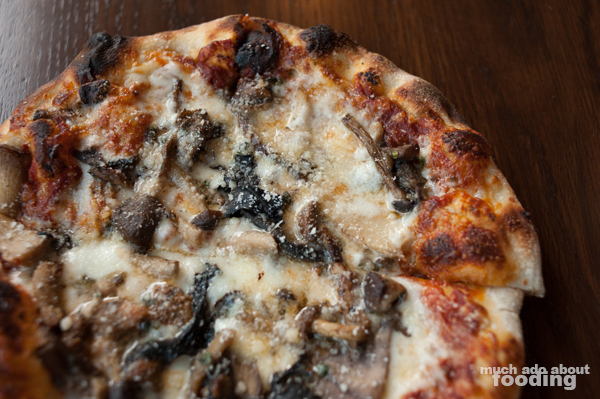 Next up was their Funguy ($7/$14 - tomato sauce, Mozzarella, wild mushrooms, and Parmesan) which was loaded with great mushrooms we did not initially expect to be thrown on a pizza. Jeff noted bluefoots, chanterelles, maitake, enoki, oysters, and trumpets. 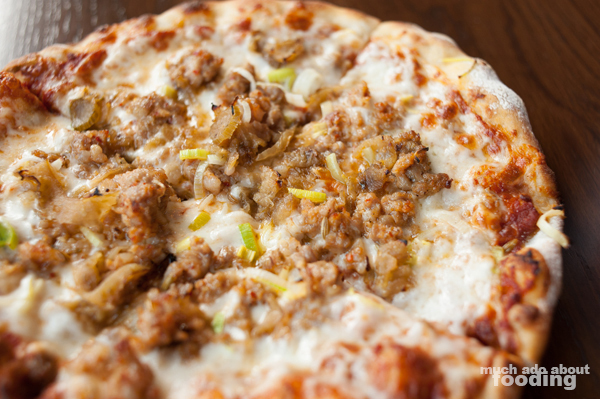 We noted a rich and umami-laden pizza pie that we'd come back for. 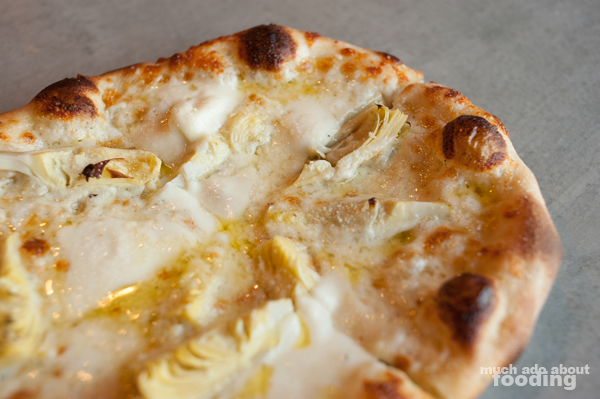 However, his next suggestion was the Blanco ($8/$16 - white sauce, Mozzarella, artichoke heart, buffalo Mozzarella, Parmesan), a pizza that will not disappoint the hearty cheese lover. If you're looking for something unique too, they do have one with a pineapple marinara. The most popular, though, is their Meat Coma ($8/$16 - tomato sauce, Mozzarella, prosciutto, pepperoni, capicola, and sausage) and what a loaded pizza it is. The crust was nearly hidden by the copious amounts of meats and for anyone who is a fan of cured meats, this is the one for you. We could definitely see this being a great fit for a large gathering keen on drinking. Meat lovers could assuredly also dig the Abe Froman the Sausage King of Chicago ($8/$16 - tomato sauce, Mozzarella, sausage, fennel, and leek) which was nicely salty from the sausage and subtly bitter from thinly sliced fennel. 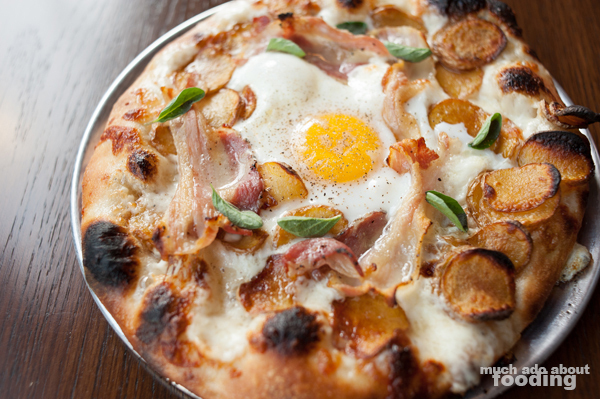 Not on the menu during that visit but joining it was a Breakfast Pizza made with pancetta and thinly sliced fingerling potatoes, topped with a runny quail egg. Talk about a great style to wake up to - we really enjoyed the potatoes because they were sliced just thin enough to have a crisp from being baked but thick enough to have some bite to each. The pancetta took the place of traditional bacon in a breakfast but with more style. We're looking forward to more of these in the future! 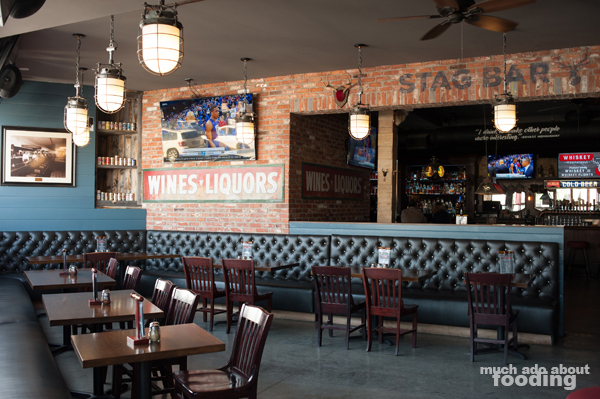 If the pizzas have tempted you enough or you just want a slice of history re-made, Stag Bar + Kitchen is located at 121 McFadden Pl, Newport Beach, CA 92663. Make sure you grab yourself a swell drink and a pie to dive into.